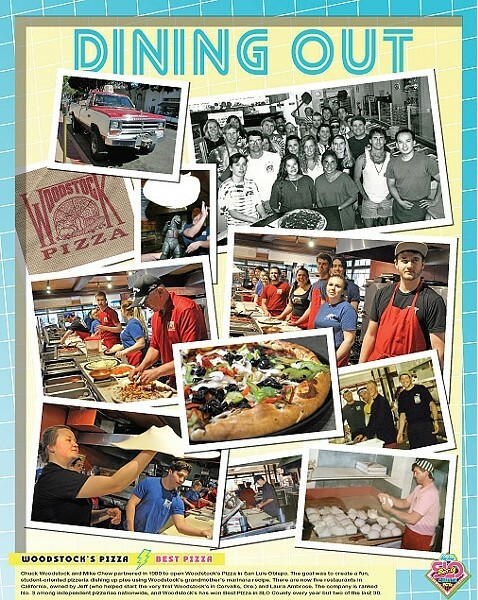 BEST PIZZA: WOODSTOCK'S PIZZA: Chuck Woodstock and Mike Chew partnered in 1980 to open Woodstock’s Pizza in San Luis Obispo. The goal was to create a fun, student-oriented pizzeria dishing up pies using Woodstock’s grandmother’s marinara recipe. There are now five restaurants in California, owned by Jeff (who helped start the very first Woodstock’s in Corvallis, Ore.) and Laura Ambrose. The company is ranked No. 3 among independent pizzerias nationwide, and Woodstock’s has won Best Pizza in SLO County every year but two of the last 30. The Range is the kind of place that even the most in-the-know foodie may not know. That is until the word-of-mouth reputation comes around. Owners Jeff and Lindsay Jackson consider this haven to be “honky-tonk French fusion”—it’s got a heavy hand of both country traditions and the culinary gourmet. Come for the great steaks, the Southern fried chicken, or the local organic “fresh kill.” If you’re headed in, remember: no credit cards, no reservations, and Google Maps will get you lost. All you need to know is it’s next to the gas station and across the street from the liquor store and post office. The salmon bisque is always good at Robin’s in Cambria. It’s beloved, according to Molly Kiely, the restaurant’s marketing manager, and much like Robin’s philosophy—sourcing high quality ingredients to create wholesome comfort food that keeps guests returning for warm hospitality and deliciousness—that creamy little number has never changed. Consistency coupled with a menu that fluctuates with the seasons are the fundamentals that make Robin’s customers happy. But there’s also an airy garden patio and that happy hour menu. For instance: nibble on steamed mussels in coconut milk for $5. Sounds like a good reason to play hooky. It’s the quintessential restaurant for SLO—it brings traditional, consistent food and service; offers entrees from both sea and land (try their American Wagyu steak); and it’s right next to one of downtown’s few surviving parking lots (for now). Stop in for a classic cocktail or a glass of wine and see where it leads. Manager Josh Whipkey attributes Ventana Grill’s success to its patrons. “We appreciate our customers who voted for us and aim to please everyone, especially our regulars.” Executive Chef Ricardo Ortega and chefs Norma Ruiz and Bryan Burns are the heart and soul of a menu that features agave bone-in rib-eye steak and crab-encrusted filet mignon, plus a lunch menu with Latin flair. “We listen to our customers and are never afraid to change based on what they say,” Whipkey said. For happy hour, try El Jefe: fresh homemade margarita mix and house-made jalapeño-infused tequila, muddled with cilantro and jalapeño. For ages, these pages have hosted a battle between Ciopinot and Novo for the coveted, punctuated bragging rights. Owner Leonard Cohen, however, isn’t one to brag. Instead, the man known for having an eye for detail—from the food, to the atmosphere, to the service—will just tell you how he approaches running his restaurant. If you think it’s too fancy, fear not; customers can enjoy a great meal without breaking the bank (they don’t have a corkage fee). Of course you can go all out and order oysters and several courses, too. Leave it to the owner of local favorite Sylvester’s Burgers to bring us the hottest restaurant of 2015. “Our goal was to bring a fun sushi joint to Los Osos with the highest quality fish straight off the boat and ramen that’s legit,” said Brian Englund, owner of Kuma and Sylvester’s Burgers. The food is simply mouth watering. Plus, sushi bar manager Hidehiko Nogi’s work is an art in itself. The team at Kuma will also soon be offering sushi classes paired with local wine and sake where patrons can learn to roll their own sushi. Everybody loves a great breakfast (some of us live for it), and Del Monte Café delivers. Located at the distinct and historic street corner across from the SLO train station, the family-owned Del Monte is a down-to-earth breakfast joint that will serve you copious amounts of pancakes and French toast for a reasonable price. There’s no doubt breakfast enthusiasts love Del Monte’s classic American diner atmosphere (comfy booths and all) and friendly staff as they chow down on the fluffy pancakes, perfectly cooked scrambled eggs, and delicious bacon. And did I mention it’s been the best for 25 years running? At Frank’s, it’s not necessarily the hot dogs that get people out of bed after a long night of SLOtown debauchery. It’s that breakfast burrito. For $6.99 plus tax, you can get yourself two eggs, two pieces of bacon, cheddar cheese, home fries, tomato, onion, mayo, and pico de gallo wrapped up in a gigantic tortilla—all day, every day. There’s also the pancake breakfast and the breakfast sandwich, but manager Hector Martinez said that the flour tortilla packed full of invigorating delights is one of the best sellers. “I think the salsa’s the secret,” he said. Big Sky Café started serving modern food—including locally sourced ingredients and vegetarian options—before it was cool. Now, just a bit more than 20 years after opening their doors, they’re still going strong. Last year, long-time Executive Chef Greg Holt bought the restaurant and took the reins. He’s continuing a philosophy that looks at a vegetarian dish as something that is not just absent of meat, but instead an entire creation of its own, where the whole is greater than the sum of its parts. Try the beet Reuben or the Vietnamese vermicelli bowl with roasted portobello mushrooms. If your name is derived from the classic seafood stew cioppino, the seafood better be good. And it is. Owner Leonard Cohen said they go to great lengths to find the best and freshest seafood that Morro Bay and Port San Luis have to offer. That includes live oysters, seasonal salmon, fresh rock crab claws, petrale sole, and halibut. To complete the experience, pair your choice with a wine from their extensive wine list (they’re big pinot fans, if you didn’t already catch the subtle portmanteau). They came, they saw, they conquered. After running two spots in the Santa Cruz area for more than two decades, the family expanded into SLO in 2013, bringing with them a refined product developed from competing in an area awash with great Mexican food. Everything’s made from scratch, including the wide variety of colorfully delicious salsa—try the pink salsa, I dare you. If you’re looking to change it up from the usual burrito or tacos, go for a torta or the signature carne en su jugo soup. “We make everything to order from scratch and accommodate special diets. We offer gluten-free soy sauce and brown rice,” said Elaine Truong, who, with husband Eric, opened Mandarin Gourmet 24 years ago. Popular dishes include pho (noodles and thin slices of beef in a savory broth) and General Tso’s chicken. “People love our chow mein and fried rice!” Something new, Truong said, is the salad roll—veggies, shrimp, and barbecued pork, rolled inside rice paper, steamed and served with peanut sauce. Mandarin Gourmet delivers great food, in house or to your house! When I first moved to San Luis Obispo and mentioned I might like sushi, everyone told me “Goshi! You need to go to Goshi!” They weren’t lying. Tucked away behind the Creamery in downtown San Luis Obispo, Goshi doesn’t try to be flashy, it’s all about the food. If you’re sitting at the bar you can see just how fresh the ingredients are. If you aren’t a fan of sushi, don’t worry about it! Goshi also serves amazing pork, beef, and chicken dishes. They always have the best fish available to them, and you can taste the difference. Thai Boat is a charming little restaurant that dishes up truly awesome Thai cuisine! The place is owned and staffed by the friendliest people you’ll ever meet. The food is authentic, and no surprise because the owners frequently travel home to Thailand, so the Boat does close occasionally without notice. Call before making the drive. When open it gets busy, but don’t be discouraged. Just step up to the counter, order, and your food will appear magically in minutes, piping hot and delicious! The curries and noodle bowls are outstanding, and the Thai iced tea is a refreshing chaser. What keeps bringing people back for more? “The quality of our products and an open-armed service at an affordable price,” said co-owner Rammy Aburashed, and he is not lying. Petra prides itself on authentic recipes and fresh pitas, and you can just tell Petra makes everything from scratch daily. I didn’t think Mediterranean food could be any better until I had their Greek feta pizza. Game changer! And they deliver. Sold! So if you’re looking for a quality homemade meal and an affordable price delivered to your door, call Petra. Santa Maria-style barbecue is treasured on the Central Coast. The recipe, perfected over family generations, is no secret. Old San Luis Barbecue Company has been perfecting its recipe, and doing it well. Steadily expanding since its beginning in 2012, “It’s the simplicity of it,” owner Matt Pearce said, that keeps people coming back. “Like what [locals] would do at home without the trouble of having to do it at home.” Also, they’re open until 2 a.m., and nothing satisfies the need for a snack after hitting the bars or quenches potential loneliness at that hour like super delicious tri-tip. Congratulations to McLintocks, the longtime eatery that’s based in Shell Beach but has restaurants throughout SLO County. McLintocks oversees its steaks with care from start to finish. First they’re dry aged, then hand cut, seasoned with their in-house Santa Maria-style dry rub, and thrown on a traditional oak-fired grill to order. Come hungry and prepared to choose from a long list of options, including the T-bone, porterhouse, baseball, filet, or rib-eye—bone-in or bone-out. If you’re having a difficult time with the decision, go for the most popular, the 6-ounce petit filet mignon. In downtown San Luis Obispo since 2011, Eureka! not only makes delicious burgers, but has an amazing selection of whiskeys, beers, and ciders. They also concoct specialty cocktails; if you get the chance to try their Holy Smokes! go for it. You can make any burger a turkey burger or skip the bun and go “naked” on a bed of arugula. “We try to be progressive with the menu, touching on trends but also keeping what we know our customers like. We are affordable in many ways while still bringing the best burgers to the table,” said General Manager Jeremy Stemen. These tacos are deliciously simple, with all the right stuff and none of the extra noise. For San Luis Obispo terms, this is as authentic as it’s going to get. Anything’s great here, including the chicken, carnitas, carne asada, lengua, or shrimp, but the al pastor will have you coming back for more. No wonder the place can get super busy with a line out the door at times. It’s always worth the wait. To wrap up their Best Of 2016 hat trick, Taqueria Santa Cruz snagged perhaps the most competitive of food feats—Best Burrito. You might as well go for the Super Burrito here, with mounds of good stuff neatly wrapped in a burrito that hints at the eatery’s greater Bay Area origins. They’ve got all the options, and everything is good—including their vegetarian and shrimp burritos. The 49er Burrito is topped with extra cheese and smothered in red enchilada sauce, and the Cal Poly Burrito is topped with green sauce. It really is all that and the bag of chips, which you’ll get free of charge. New Times readers were feeling the love for Ciopinot during this year’s Best of SLO poll. That love bubbled into this category, which took owner Leonard Cohen by surprise. Cohen could cite only the obvious reasons for all the voters’ love of Ciopinot’s chowder—it’s really, really good. They have three styles of chowder, two of which are more commonly found out West—the Manhattan clam chowder, which is red and brothy, and the creamy New England clam chowder. Ciopinot also makes a traditional roux-based French style, to which they add bacon. Not all doughnuts are created equal. There are run-of-the-mill doughnuts and there are SLODOCO doughnuts, which are culinary works of art and come in tantalizing flavors like maple bacon, Nutella, and chai cream cheese. “We try to really work with what our customers want,” manager Haley McLaughlin said. “Some of our most popular doughnuts like doffles [doughnut waffles] and the milk and cookies doughnut [with cookie dough] have come from customer suggestions.” An expansion that includes a stage for music is in the works. And did we mention they’re open 24/7? Who would believe that Emily’s Cinnamon Rolls was created by a 10-year-old entrepreneur named Emily? It’s true! This power girl turned her recipe into dough, then sold the business last year to Alex Che and Christian Mantilla. They continue to bake the kind of fresh, hot cinnamon rolls your grandma used to make, using natural ingredients with no preservatives. Che said their most popular bun is the traditional, with classic cream cheese frosting! I’m partial to their pecan sticky buns and seasonal pumpkin cinnamon roll, savored slowly with their freshly brewed coffee. Can’t decide? Buy a combo pack! When I lived in Southern California, my first stop back in SLO would always be High Street Deli. The sandwiches are just that good. “I think we win for a multitude of reasons,” manager Jon Barcellos said, “being the best sandwich in town, and our customer service is superior as well. The Dutch Punch Crunch and Cal Turkey sandwiches are both staples.” Stop by any day between 4:20 and 5 p.m. for a sweet discount on your sando and grab a doobie snack, aka the shop’s delectable blondies, for a sweet treat. Owner Sheila McCann, has been rolling dough for 20 years. “I feel good about what I bake and sell. It’s definitely a feel-good business.” She bakes six house breads and rotates other favorites daily. “There’s not that many bakeries, and people really appreciate natural handmade products, buying locally, and want to know who makes their food,” McCann said. House of Bread is now also a deli. “We offer sandwiches made with Boar’s Head premium meats, soups and salads, and we do catering,” McCann said. The bakery also offers gluten-free products, some of the most sinful cookies and cinnamon rolls, and even dog bones! “Dining on the patios at night is like being transported to somewhere magical,” according to Novo Marketing Manager Molly Kiely. And she’s totally right. “With the lights, the nearby water, the frogs chirping from the creek, the foliage, and the old oak tree, it’s a true gem in downtown SLO that we’ve become the lucky stewards of.” You can get crazy, dancing under the stars to DJ’ed beats; get lazy in the sun with a glass of wine in the middle of the day; or get cozy under the trees with a dinner date. “It’s good for the spirit,” Kiely said. More than 20 years ago Ross and Joanne Currie opened a little cafe in Pismo Beach serving up steaming bowls of thick, creamy clam chowder. Now, with two locations in SLO and one in Pismo Beach, they make a big Splash with kids. All three cafes feature colorful, beach-themed wall murals painted by Lynn Mercer. Brett Collins, manager at the Higuera location, says, “We have a casual, family atmosphere where kids can relax and be themselves.” Munchies for munchkins include grilled cheese, burgers, hot dogs, corn dogs, and kid-sized fish or chicken and chips. Almost everything on Urbane Café’s menu is under $10. Actually, most of it costs less than $8.50. That’s a seriously good price for lunch on the patio overlooking Higuera Street, gawking at the walkers-by and making fun of them in your head. And it’s all so fresh. Avocados, sundried tomatoes, turkey, ahi tuna, feta, chimichurri steak, Santa Maria-style barbecue—plus there’s that fresh-baked focaccia bread. The list of available options is endless, and one of my reporters definitely eats there once a week. Family owned and California grown, they exist to make you happy. “So there was this blind man, right?” Thus begins the best and only joke I know about fish markets. The punch line, it’s not fit to print. But here’s the deal: San Luis Fish and BBQ has the best fresh and local caught fish you’re likely to find on the Central Coast, without a whiff of pretention. The store, located near the Jack House on Marsh Street is a little blue gem of old San Luis Obispo. It’s locally owned, and locals know that the chipped azure exterior with modest benches belies the pure magic they are making behind the counter. Arroyo Grande Meat Co. owner Henry Gonzalez said that his shop is not really a store, but rather it’s like a custom tailor. “Our job is not to sell you things, it’s to get to know you,” he said. “We have many customers that when they walk in, I know exactly what they want, and I can cut it for them. I know exactly what they don’t want.” That’s just part of what makes them unique—they’re also known for a wide variety of house-made sausages and an ability to accommodate for custom cuts or aging requests. Over the last four years, Haute Skillet morphed from a food truck into a sort of mobile catering unit, but, “We had no plans to do catering,” co-owner Anna Andriese said. At a certain point she and her husband, Steve, had to make a choice: keep the route or take on more event customers. So they made the jump. Opting to continue growing their business, they now take their food truck—which specializes in gourmet sandwiches with sides like potatos au gratin and cumin-roasted heirloom carrots—to a party near you. It brings a fun, casual aspect to weddings, Andriese said. indicates a category created by reader request!